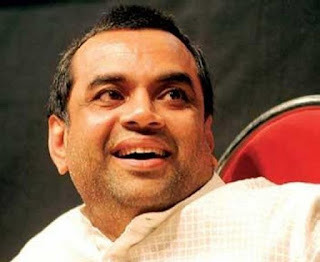 Paresh Rawal,the name itself is a story. I am writing this post as a big fan of this great actor.I am not familiar with the art of acting.But I felt flexibility ,perfection,and simplicity of getting into the character.Its magical for me.How anyone changes themself into the character is phenominal.Especially I like the way Pareshji carried marathi man Baburao Ganapatrao Aapte. It was just great. In my opinion it was the most comic character of the century. If I heard or read this name lots of characters played by him came into my mind like Baburao in Herapheri(2000),Hijra in Tamanna(1996),a recently Tukaram Patil in Mumbai Meri Jaan .I think Tukaram patil played by him was very touching character.It was very deeply attached role he played. I thought that time he will get best actor this time.But bollywood is becoming more glamourous than ever before. Another thing by which I feel a bit closer to him is that my grandpa (mother's father) looks like Baburao ,wears 'Chashma' like him and have similar comic sense which makes me to remember Baburao again and again. I dont know how this man is in real life,but I will definetely grade him as a Superstar. In todays bollywood glamorous industry no one is recognising such talent .Just only felicitating with sweet words is not enough.Such actors must be awarded. Paresh Rawal is always Superstar for me.